- 1 month stay: 50% of the month. - 2 to 4 months stay: 1 month. - 5+ months stay: 2 months. The Bills are NOT INCLUDED in the rental price of the property. An estimated minimum cost is 150 eur/month. This payment must be paid with the monthly rent. At the beginning and the end of your stay we will take reading of the relevant meters. If there is excessive use of any of the utilities, you will be advised of the difference in cost which should be paid at earliest opportunity. Apartment was missing some things such as dishwashing detergent and sponge to wash the dishes. Other than that it was great. Central Location, bus and metro next the appartment , also bakkery and supermarket and a very good little restaurant for seafood, called PORTONOVO SILVESTRE, Creu Coberta 37 If you dont like hotels, it is the best option for a stay in Barcelona. I am very surprised by this city in a positive way. Great appartment for two persons. The door lock did not work properly all the time. At night the water sometimes was missing. The apartment ADN 42 is located in Sants area. Metro stop - 114 m.
Metro stop - 353 m.
Plaza de España - 0.41 km. Foundation of Joan Miró - 1.66 km. There are no any power for clothes washing machine, only two tablets for dish washing machine (it's not enough), no shelves in bath cabin (no any possibility to put soap anywhere in cabin), no any cleaner powder, very little amount shampoo for two adults per one week.. And other small but important things. Thanks. Can't beat the location, quality, and price for a week at Mobile World Congress. Apartment was nicely appointed nod furnished. Super quiet despite being on a busy street. Close to metro, markets, public car park, tourism, etc... will definitely hope to book again next year. lovely clean apartment. ideally situated. caretaker very helpful, knowledgeable and informative. no complaints at all, would definitely recommend these apartments - in fact we already have done! Appartement très sympa ,Et conforme à la description.Juste un soucis avec la douche qui a un problème de pression . Very good location and clean place facilities very adequate especially with washer the lighting circuit cutoff during our stay as some others downstair.Instruction on fuse/breaker panel switch provided,but not clear.We made do with other power oulets.So it was ok.
Because it was not my first visit in Barcelona, I know where I want to stay. So I search for accomodation in this part on purpose. You are almost at the Plaza Espanya, so you have plenty possibilities for transfer. There is a train station very close by, if you want to explore other cities and places around Barcelona. We loved this apartment. Clean fluffy towels provided; linens clean -- all of it was very clean when we checked in. Some amenities provided which was great. Nothing felt cheap. What you don't expect from the description is how great the location is -- under 5 minute walk to Placa Espanya, next door to a great market. So easy to get all over Barcelona from here. Excellent help checking in. Great, not too touristy area. Appartamento moderno e fornito di tutto il necessario, posizione perfetta con i trasporti pubblici appena fuori di casa. very nice appartment, good location next to metro station and close to placa d'España. Very good bed, plenty of space, very quite even when close to busy street. Very good restaurant next door. This Barcelona Apartment is a new addition to our selection. After an exhausting day of sightseeing, enjoy a relaxed evening in your apartment. Modern and comfortable apartment in Barcelona with lovely Terrace. 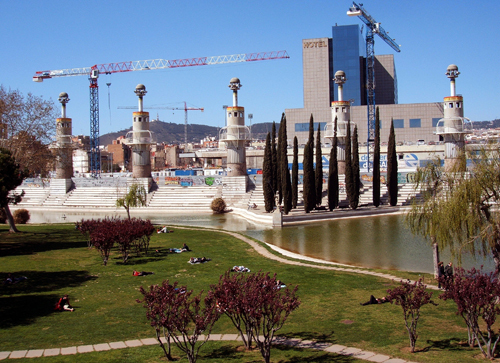 Located in the quiet district of Sants, just few steps from Plaza España. Easy access to public transportation.